The setup was founded when I, way back when, trudged around in Army clothes in deep winter way up north in Sweden. But then the baselayer was wool gloves. 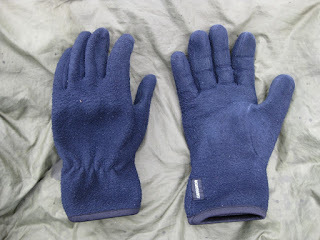 That worked alright when I could get a new pair every week, but when I had to pay my own way I switched to fleece gloves, like the ones seen above. When it comes to this baselayer I have probably used, worn out or lost ten pairs during the decades. I want them pretty tight in order to be able to fiddle with stoves and other things without baring my hands to the cold. I ski in them and it has to be pretty cold, or windy, in order for them not to do the job, once I have been going for a while and the body is generating heat. They wear well and dry out fast. In deep cold, or cold and wind on the tundra, my trusty pair of Helly-Hansen pile mitts with the nylon shell, has been with me since the early 80's at least. They are of a huge size and I almost alway wear them on top of my fleece gloves. They have always been windproof enough and warm enough inspite of some severe weather. When digging in the snow to make bivouacs or simply to anchor my tent I wear them to keep the fleece gloves dry. The mitts always dry out fast, even in wintry conditions. Sometimes I have used them to pull over my feet in the sleeping bag. There might be better mitts today, buy why change a winning team? To shovel or to claw?